After an encounter with the Timeship Aeon, Captain Janeway and her crew found themselves on Earth in 1996. The appeal of being on Earth - even in the past - was intense. Place on Mission. All personnel here are attributes all -1. 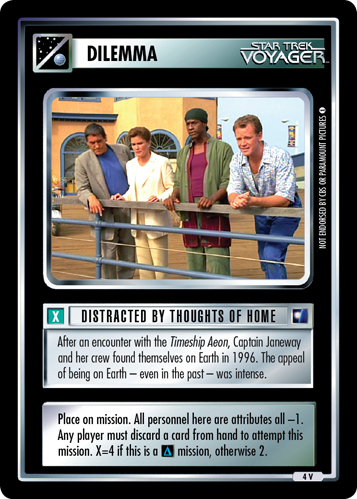 Any player must discard a card from hand to attempt this mission. X=4 if this is a mission, otherwise 2. Characteristics: Countdown icon dilemma, place atop mission. The logging for the game text of this card is not completed. Please help us with this task and visit our interactive ST1E card-database to validate the game text of this card (actual state: Changed).